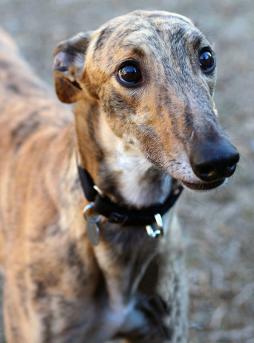 History: Of the five pups in Craig’s litter, three raced, including Craig. 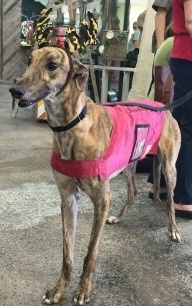 His racing career began in Birmingham and ended at Gulf Greyhound Park on September 5, 2014 with a broken leg. His leg was repaired and healed. His owners tried to rework him to see he would run again, but he was ready for retirement instead. Craig's race name, Craghoppers, apparently is a clothing line as are the other names of the pups in that litter. 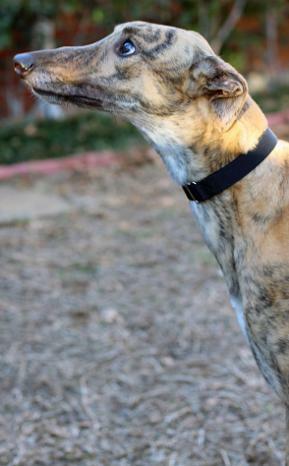 His dam, CTW Cheerzilla, is a Clear the Way dog; and his sire is Gable Sour Cream, part of the Gable Dodge line. Craig is an adorable red brindle boy with lots of personality. He is ready to discover all retirement has to offer. Craig is happily sleeping on his forever couch with TAGS alumni, Haven (formerly Taylor), Buddy, Kingsley and the Brooks family. 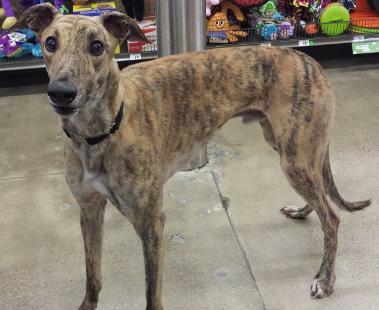 February 6, 2015 update: Craig, now Gideon, has found his lifetime home with TAGS alumni, Haven (Taylor). Congrats to all!! 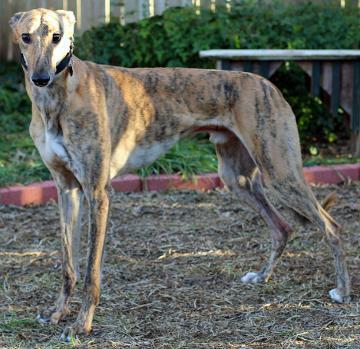 January 15, 2015 update: Craig has learned a lot in the two months he has been in a foster home. 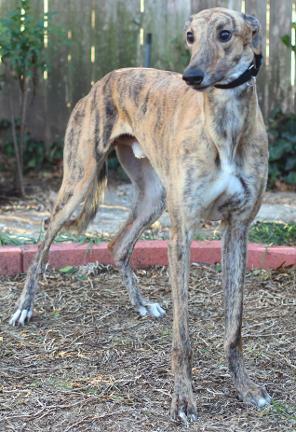 He gets along well with other large dogs (especially Greyhounds). He’s easygoing in the house. He has the hang of housetraining now but would prefer not to be crated for long periods of time. 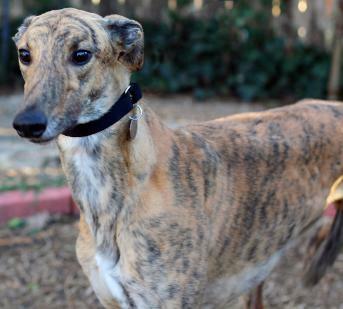 He is very affectionate and would prefer that you pet him than some other Greyhound. Even if sleeping, he senses when another dog is getting attention and he magically appears to get a share of the petting. He loads and rides well in the car – usually in a reclining position. He does well when out in public (except when small dogs are around). So far he’s made no effort to get on furniture or the bed. He loves to play with stuffie toys but has a tendency to want to tear out the squeaker and stuffing. He makes greyt eye contact with those gorgeous big brown eyes. He’ll make someone a loving companion. 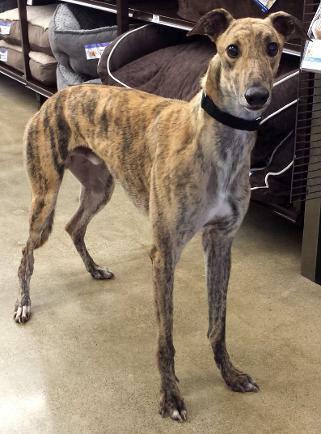 November 15, 2014 update: Craig came to TAGS for a life of retirement and to find his loving lifetime home. This was a big day for Craig – zonked out in the car, his first bath at Unleashed, a quick photo session and back on the road to meet the new hounds and human in his new foster home. He checked every inch of the house and yard and is now zonked out on a dog bed. That didn’t take long.